The event was very well attended on March 20, 2018 at the Grace UCC Church in Rutland, VT, hosted by Board member Steve Berry along with Pastors John and Tracy Weatherhogg. Climate Ride events bring together bright minds, breathtaking routes for all cycling abilities, and the unforgettable combination of passion and purpose for environmental advocacy, education, and sustainable transportation. In 2016 Dave Conna worked with Climate Ride to get SolarFest listed as a beneficiary alongside prestigious organizations such as the Union of Concerned Scientists, 350.org, and the Nature Conservancy, to name a few. 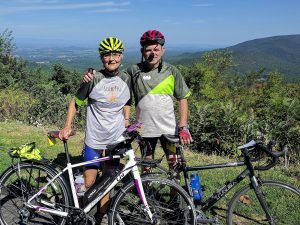 In September 2017, Catherine Bock joined Dave in launching the debut SolarFest Climate Ride Team at the Virginia’s Blue Ridge Mountains to Washington DC Climate Ride. It was a stunning beautiful 3-day ride covering 208 miles through one the most acclaimed cycling routes in the world, with highlights including the Blue Ridge Parkway, Shenandoah National Park, the Old Dominion Trail, and the National Mall. Plus, they raised over $4,000 for SolarFest! There are so many advances and policy changes impacting conservation and renewable energy that people need help to keep up. 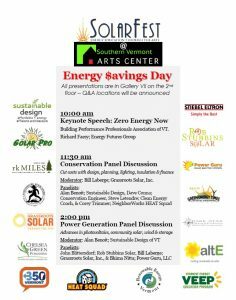 This showcase of leading experts and helpful presentations focused on practical, how-to information to help cut electric, heating, and cooling costs with the latest in energy conservation and renewable power ideas for homes and business. Discussions with skilled practitioners about slashing energy costs and reducing carbon surrounded by student artwork from 22 schools for a wonderful synergy of energy and art. On Friday November 4th at 6:30 pm SolarFest hosted a screening and discussion of the latest film from Oscar Nominated director Josh Fox in the beautiful Arkell Pavilion at the Southern Vermont Arts Center in Manchester (See trailer here). 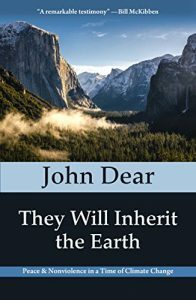 Climate change may be the greatest threat our world has ever known. How to Let Go of the World and Love all the Things Climate Can’t Change was shot in 12 countries on six continents, the movie asks what is it that climate change can’t destroy? What is so deep within us that no calamity can take it away? Doors opened at 6:00 pm, with refreshments provided by local sponsors. A moderated discussion of climate change began at 6:30 sharp, with the 2-hour film beginning at 7:00 pm.